While confined to bed by a chest cold, I read the entire Book 1 of Minna Sundberg’s Stand Still, Stay Silent webcomic (SSSS to aficionados) in one go. She’s an assured, accomplished stylist — the scapes and maps are simply breathtaking. The premise is interesting, the use of the Scandinavian and Finnish background is original in the comics context, the mix of “cozy” dystopian near-future SF and mythic magic mostly works, the humor is quirky and subtle, the moments of genuine anguish are wrenching. But the content doesn’t match the style in quality (in all fairness, an endemic issue in comics). Sundberg was in her early twenties when she started SSSS and it shows in how she depicts age. I quickly got fed up with the three (eventually four) angsty self-absorbed bishonen; and the decision to make the one girl among the young contingent of the high-risk mission both a mundane and fridging material for the all-important boys left me totally underwhelmed. Character-wise, I preferred the prologue: it had a better age mix and illustrated normal messy human interactions well. Most of the disasters that happen in the main story are directly due to the protagonists’ extreme youth, lack of experience and lousy social skills. There are no sexual or romantic relationships in the main story; all the real friendships are bromances between the four boys who are depicted as androgynous, Wraeththu in the making: tossings of fabulous hair and less fabulous tempers abound. The main story has coming of age arcs for the boys (well, up to low double-digit emotional age)…and a stoic suicide for the girl, whose “necessary” fate reminded me uncomfortably of the authorial mindset that dictated a girl’s death in “The Cold Equations”. One of the boys in SSSS, in an identical starting spot as the girl, not only survives but is additionally rewarded with the discovery he has magic powers. On the plus side, the societies remain egalitarian and sturdily matter-of-fact post-apocalypse (the remnant tech is way higher than warranted by the specifics, but it’s good not to have the customary brutal survival narratives for once) and the two “old” members of the mission show a welcome inversion of the standard gender roles: the woman is a Valkyrie-type warrior with the temperament that goes with it, whereas the man is an unflappable medic who acts as den mother and has read enough to know/remember that logogram-based languages are not mysterious runes. He also looks like 50 though he’s ostensibly 34 (I wonder if they practice ice floe culling in this universe when people start looking “gross” by teenage criteria) and is chubby. The other roundy is the sacrificial girl, to distinguish her further from the willowy bishonen in addition to her lack of either prowess or magic. Not surprisingly, given its location and the preferred age bracket of its protagonists, the SSSS cast exhibits very limited physical variation. Nationalities are signaled by differences in hair color: Icelanders boast copper tresses, other Scandinavians gold, Finns silver. “Old” people’s hair fades to uniform brown though two frumpy “ancient” women (probably in their fifties) in helpmate roles have black hair. That said, it’s a fact that Icelanders are among the world’s most homogeneous populations and geno/phenotypic diversity would decrease further after a global epidemic like the one posited in SSSS. One fascinating aspect of SSSS is that this universe is governed by the Scandinavian and Finnish pantheons but not in the heavy-handed intervention mode made familiar by the Thor Marvel franchise. Instead it’s a shamanic mode that focuses on dreamtime and the uncanny (the Swan of Tuonela and a nightmare version of Sleipnir are prominent presences, as are spirit and flesh animal familiars), retaining the quietness of the Silent World. I liked SSSS despite its irritating protagonists — the dazzling wide-angle panels and mythic segments have stuck in my memory — and I’m curious to see what Sundberg will do if/when she grows past her neoteny. 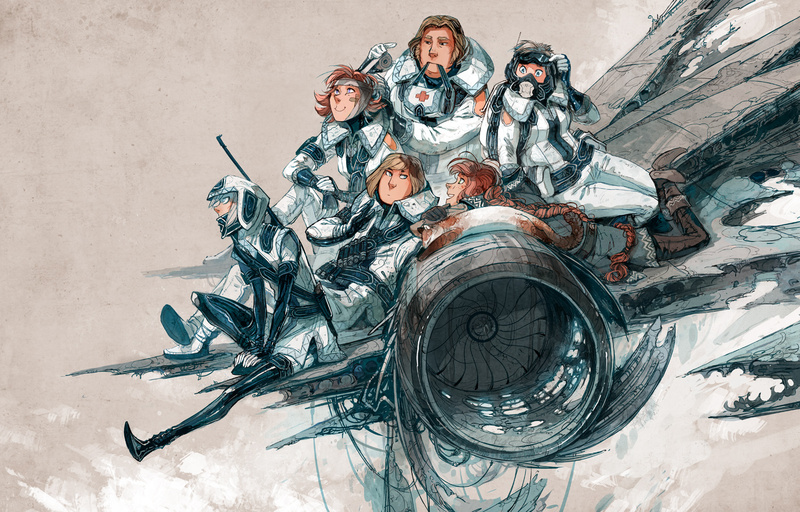 Image: The SSSS main crew (one of many artworks related to the webcomic at the creator’s site).